This design was inspired by the vintage grain sacks at the Flemish mills. A very durable fabric that offers charm and can serve many different purposes. 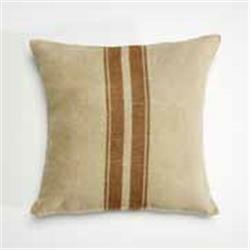 The design is a mink brown stripe on a flax background. Decorative pillow cover 20" x 20"
See also matching coverlets and bedding shams. The Grainhall stripe collection also offers tablecloth - napkins - runners and placemats.